These use the natural effect of evaporation to cool you down. When these vests are placed into water the specially made non-toxic material absorbs hundreds of times its weight in water. This stored water is then slowly released. In hot conditions, this water will start to evaporate. As it does, the heat from the wearer is transferred into the air helping to reduce your temperature. Easy to use throughout the day. If it dries out all you have to do is submerge into water for hours more cooling. Small* 34" to 36" 20" 50 to 100 lbs. Medium 38" to 40" 21" 110 to 175 lbs. Large 42" to 44" 21.5" 175 to 310 lbs. XL 46" to 48" 22.5" 275 to 360 lbs. XXL 50" to 52" 23.5" up to 400 lbs. Welcome to Polar Products Inc. We are a family-owned and operated business specializing in the design and manufacture of innovative, high-quality, competitively priced body cooling and hot and cold therapy systems. Polar Products has over 25 years of experience cooling people in diverse applications, including industrial safety, construction, emergency services, athletics and fitness, the military and people with medical heat-sensitivity. We are proud to manufacture the most comprehensive and complete line of body cooling products in the world. 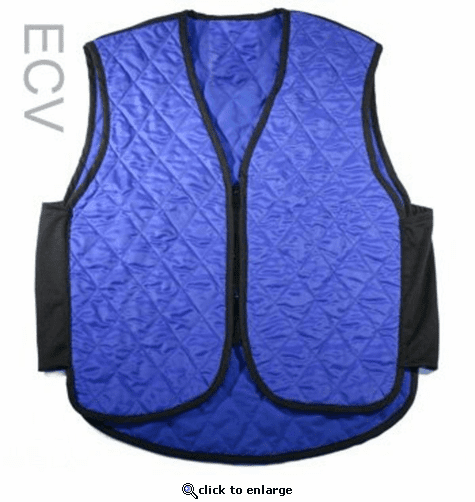 At The Warming Store, we have cooling vests available for a range of activities and uses.